Home > Comet Clutches and Parts > Comet 206515A. For 94C Comet Duster. Sold as One Package of 3. > Comet 205583A Orange Spring. Comet Industries 205583 "Orange" Spring. Comet 205583A Orange Spring (Package of One). 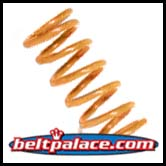 Comet Industries 205583 "Orange" Spring for 94C Duster Centrifugal Clutch System. Comet 205583A Orange Spring. 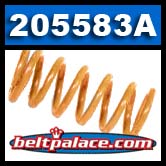 Comet Industries 205583 "Orange" Spring for 94C Duster Centrifugal Clutch System. For use with Comet Duster 94C drive units Comet Duster 206094A, Comet Duster 206096A, Comet Duster 211493A, and Comet Duster 211879A. Sold as One 205583A ORANGE Spring. Genuine 205583-A made in USA by Comet Industries.